The decision of 19 EU member states to follow Washington’s suit and support self-proclaimed interim president Juan Guaido undermines the bloc's authority in foreign affairs, Alejandro Fierro, a member of the Latin American Geopolitical Strategic Centre (CELAG) has told Sputnik. It's the very concept and the essence of democracy that is at stake in Venezuela, says Alejandro Fierro, a member of the Latin American Geopolitical Strategic Centre (CELAG). 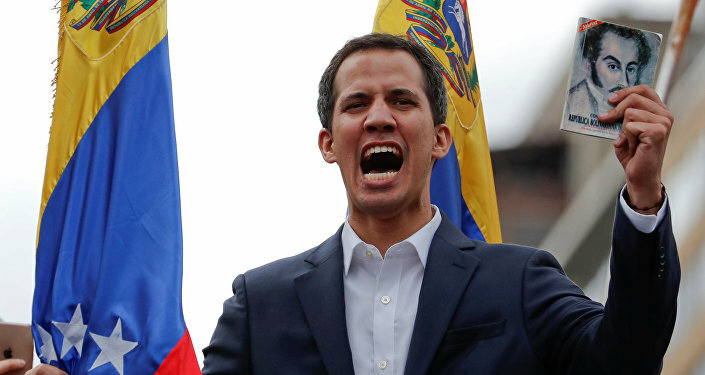 "It is neither about chavism, nor supporting or rejecting [Juan] Guaido, it is the question of democracy", Fierro told Sputnik Mundo. "What about more than 9 million people who came to vote on 20 May ? (…) People not only expressed their opinions, they put forward an absolutely legitimate demand". He elaborated that the recognition of Guaido, who did not participate in the elections, contradicts the results of the vote "which should serve as an absolute mandate for all external and internal political players". To date, 19 EU countries have recognised self-proclaimed interim president of Venezuela Juan Guaido, de facto denying the results of the May election that re-elected Nicolas Maduro to another term as president. On 4 February, the EU member states' eight-day ultimatum urging Caracas to kick off new presidential election expired. According to the scholar, the eight-day term put forward by European countries was "completely unprecedented", since it has only added to the ongoing political crisis. He stressed that "the EU does not have a common foreign policy ", adding that the recent move by European states is "undermining the bloc's authority in foreign affairs". According to Fierro, the union "cannot act as a reliable participant in any negotiations or dialogue". "Donald Trump specifies direction and European countries follow it. The EU and many of its member states, including Spain, are dwarves in foreign policy. When I say 'dwarves' I say this without any derogatory assessment", he said referring to the US-led invasion of Libya joined by Washington's European allies. Fierro noted that the situation that is now unfolding in some European states is strikingly similar to that in the countries of the Lima Group, which use foreign issues, or "foreign ghosts," to divert public attention away from domestic problems. "For several years, Venezuela was used as such a 'ghost' in some countries", he remarked, saying that in the countries that recognise Juan Guaido, governments are facing serious internal problems. According to the scholar, the focus on Venezuela "is the way to change the subject of debate, to draw the attention of citizens to problems that may be located 7,000 or 9,000 km from their place of residence, instead of solving internal problems". Meanwhile, "chavism continues to remain an enormous political force voluntary supported by millions of people in the country", Fierro said. He refuted the MSM claims that what is going on in Venezuela is the people's fight against the ruling class: "Anyone who lives in Venezuela can see and record this. This is indicated both by election results and street demonstrations", he remarked. Commenting on Washington's assumption that the Venezuelan Army may support Guaido, the scholar underscored that the country's military forces obey neither Maduro nor the government but the principles established by the Constitution. "Today there are a lot of speculations about the problem in the army, but I sincerely believe that, unlike the situation 20, 30 or 40 years ago, the commanders of the Venezuelan Army are loyal not to Maduro, Chavez or the government, but to the Constitution adopted in 1999", Fierro concluded. The president of the disempowered National Assembly Juan Guaido declared himself the country's interim president on 23 January. Earlier, on 5 January, the body, stripped of legislative power following violent protests of 2017, claimed that Maduro's second term was "illegitimate". The US recognised Guaido calling upon its allies and partners to follow suit. While 19 EU member states took the side of the self-proclaimed leader, Italy refused to recognise him. Russia, China, Turkey, Iran and many other states have signalled their support for Maduro, the legitimately-elected president of Venezuela.